ISTEC meters are ideal for applications where you need a minimal pressure drop or liquids with suspended solids. 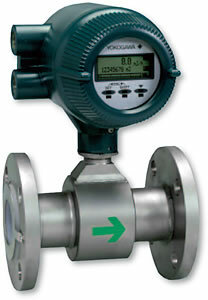 These meters are available in sizes from 0.1" through 16". The display can be mounted on the flow tube or mounted remotely. The LED display shows rate, total and other set-up and diagnostic tools. The Reduction of Lead in Drinking Water Act of 2011, has been amended to the Safe Drinking Water Act (SDWA) in effect as of January 4, 2014. Our products include meters for potable use and for manufacturing, irrigation, toilets, or washing machines, which are excluded from the new regulations. Certain products we provide meets the new standard. Consult factory for more information and pricing. By constantly monitoring the change in the impedance of the electrode circuit due to the build-up of insulating coatings, the AXF converter will display 4 different levels of coating. When the third level is exceeded, a warning is displayed; when the fourth level is exceeded, an alarm is displayed. Electrode maintenance and cleaning becomes easier because the user can rely on the new predictive diagnostics to monitor the status of the electrodes and then remove them for cleaning if necessary. Available in 1–16" sizes. The LCD indicator employs a large, back-lit, full dot matrix display. One to three lines are available to indicate a wide variety of display possibilities. Infrared switches permit programming through the glass without the need to open the enclosure cover. Replaceable electrodes, field rotatable converter housing, mirror finished liner, special gaskets, etc.